A prayer meet for Bharatiya Janata Party stalwart Atal Bihari Vajpayee on Monday saw leaders across the political divide hailing him as 'prime minister for everyone', with the opposition stressing on a need to follow his legacy of taking all along and Prime Minister Narendra Modi saying he withstood a "political untouchability" against his party to stick to his ideals. Rashtriya Swayamsevak Sangh chief Mohan Bhagwat said Vajpayee lived an exemplary life of an Rashtriya Swayamsevak Sangh volunteer in politics as well and remained steadfast to the organisation's ethos. 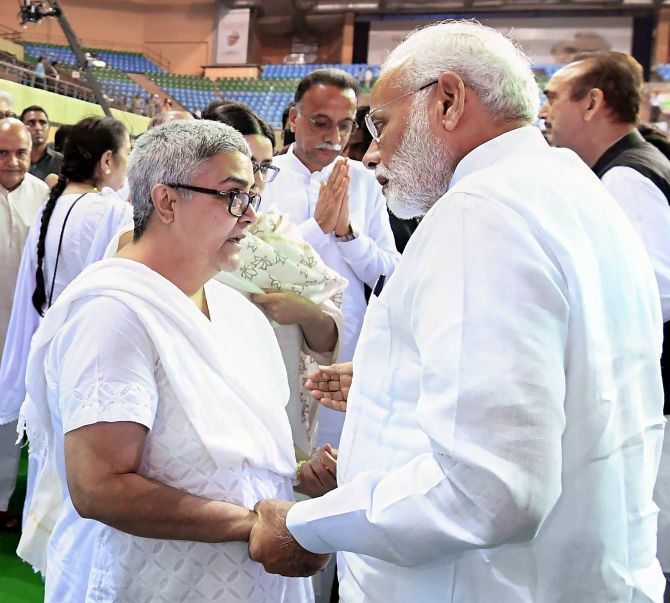 Leaders of all major parties and of organisations representing different religions came under one roof to pay tributes to the former prime minister, with some like Derek O'Brien of the Trinamool Congress praising him for his secular credential and Ghulam Nabi Azad of the Congress lauding him for taking everyone along. 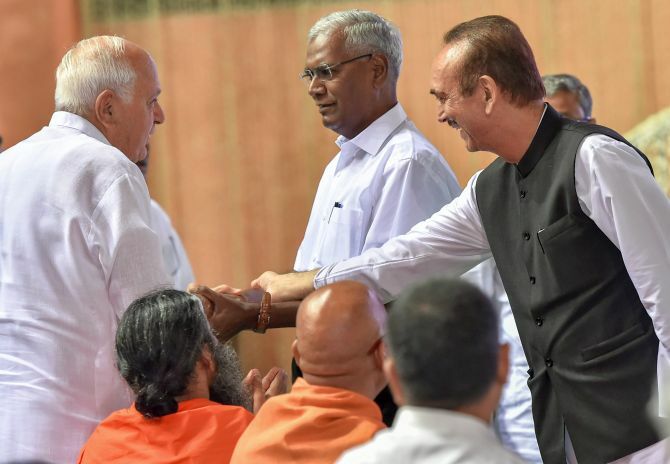 Rival parties from Kashmir -- National Conference and People's Democratic Party -- spoke in unison while praising Vajpayee's handling of the festering issues faced by the border state, with former chief minister Mehbooba Mufti describing him as a messiah for people there. Modi said it was Vajpayee who changed the narrative on Kashmir during his speech in the United Nations and brought the issue of terrorism to the centre stage and as prime minister he did not buckle under pressure despite sanctions imposed against India after nuclear tests in Pokhran in 1998. Vajpayee attributed the tests to the brilliance of India's scientists and two days later, India tested again and showed what a strong political leadership can do, the prime minister said. "He showed that India is Atal (resolute)," Modi said. 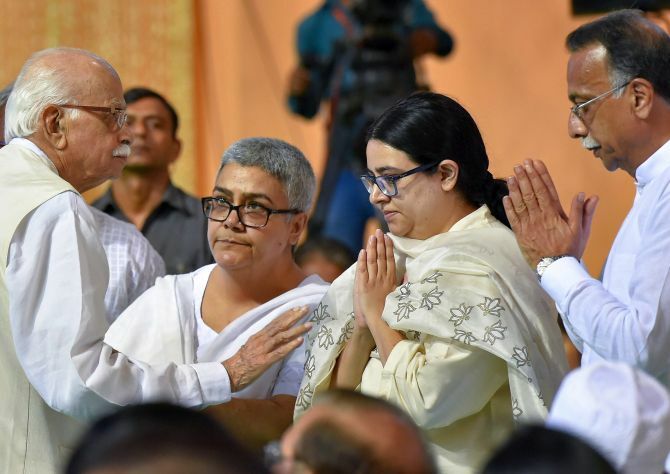 Veteran BJP leader and Vajpayee's colleague in the party for more than six decades, L K Advani, paid an emotional tribute and said he never imagined that he will have to speak in such a gathering. Azad bemoaned the distance between the government and the Opposition seen today and said it did not exist earlier. 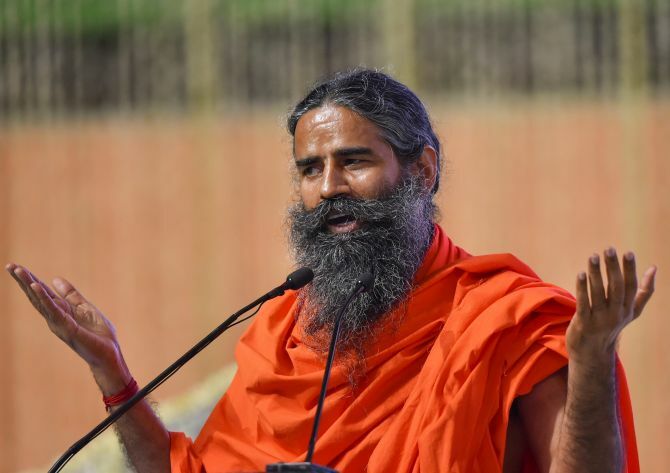 Modi also referred to formation of three new states, Uttarakhand, Jharkhand and Chhattisgarh, under the Vajpayee government and said it was done without creating any bitterness, an apparent reference to rancourous aftermath of the division of Andhra Pradesh by the UPA government and it continued political repercussions. 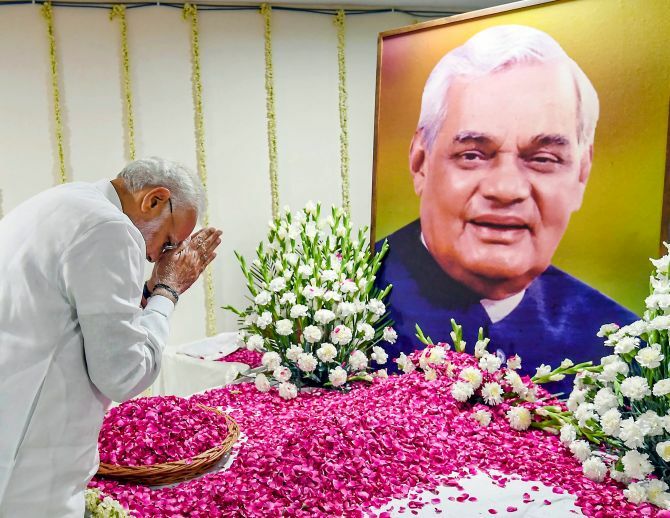 The prime minister said Vajpayee would remain an inspiration and said the outpouring of emotions following his death despite his being away from public life for over a decade due to illness, shows his greatness. That Indian wrestler Bajrang Punia dedicated his gold medal in the Asian Games on Sunday to Vajpayee was a tribute to the former prime minister's greatness, he said. Vajpayee lived each moment for the common man and right from his youth to the time his body supported him, he lived for people, his principles, and for the aspirations of the common man, Modi said. "He stayed in opposition for so long, yet his ideals remained untouched. He respected parliamentary traditions and when the opportunity came, he implemented his vision for the benefit of the people," Modi said. BJP president Amit Shah said BJP workers will follow the path shown by the former prime minister as he expressed his thanks to leaders of various parties who had arrived at the prayer meeting to pay their tributes. Anand Sharma of the Congress, Trinamool Congress's Derek O'Brien, who hailed Vajpayee for his secularism, Satish Mishra of Bahujan Samajwadi Party, D Raja of the CPI, Lok tantrik Janata Dal's mentor Sharad Yadav, National Conference leader Farooq Abdullah, People's Democratic Party leader Mehbooba Mufti, Ram Vilas Paswan of Lok Janshakti Party, Harsimrat Kaur Badal of Akali Dal were among those who attended the meeting. Lok Sabha Deputy Speaker M Thambi Durai and Rajya Sabha Deputy Chairman Harivansh also spoke on the occasion. Vajpayee died on August 16 at the age of 93 following prolonged illness. He first became prime minister in 1996 for 13 days, then in 1998 for 13 months when the National Democratic Alliance again came to power and finally in 1999. He served as prime minister for a full term but his alliance lost in 2004.